One of the city's great skyline buildings even though it has been dwarfed by some towers on 57th Street, the Hampshire House is noted for its spectacular, steeply-pitched copper roof with two tall chimneys. 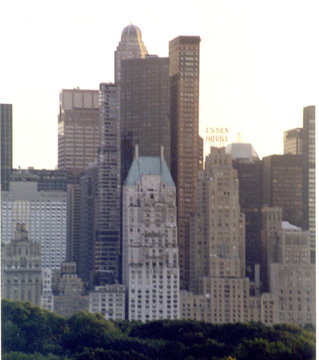 "While the opening of the Pierre and the Waldorf-Astoria effectively marked the end of hotel construction in the Metropolitan Era, the strange circumstances that surrounded the completion of Caughey & Evans's Hampshire House, once labeled 'Manhattan's Monument to Frenzied Finance,' revived the old spirit at the end of the Depression," noted Robert A. M. Stern, Gregory Gilmartin and Thomas Mellins in the great book, "New York 1930, Architecture and Urbanism Between The Two World Wars," (Rizzoli, 1987). The 37-story building was started in January, 1931, but abandoned six months later by its developer, the H. K. Ferguson Company of Cleveland, and, the authors continued, "stood derelict until 1938." "Executed in glistening white brick, Hampshire House was a strange hybrid, a cascade of setbacks attached to a rectangular tower that rose from the back of the lot. The tower was crowned by a steep copper roof and twin chimneys that referred to the Savoy-Plaza, but the dormers below were Spanish Baroque, and the base of the building with its rusticated white marble walls aluminum fixtures, and polished black granite trim was as stylish example of Modern Classicism," the authors wrote. 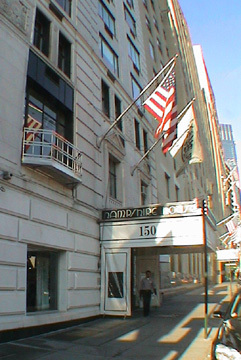 The Savoy-Plaza was the very large hotel designed in a neo-Classical/French Renaissance style by McKim, Meade & White on the present site of the General Motors Building across Fifth Avenue from the Plaza Hotel. 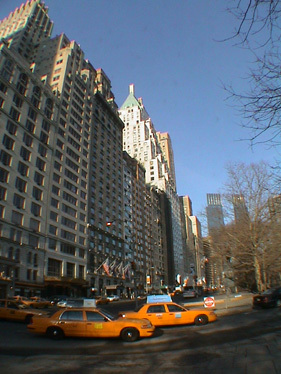 The Savoy-Plaza made the southeast corner of Central Park the city's most elegant enclave as it tied together the formal elegance of the Plaza Hotel and the Bergdorf Goodman store with a massive but elegant tower noted for its pitched roof, a photograph of which graces the cover of "New York 1930." Only the former Pennsylvania Station and the Singer Building on Lower Broadway were greater architectural losses in the city in the 20th Century. Despite the authors' comparison of the Hampshire House with the Savoy Plaza, the Hampshire House's roof was more dramatic and much more colorful. While their description of the façade is accurate, their categorizing it as Modern Classicism is not terribly relevant. The base of the building does have moderne elements, but they pale in comparison with its great roof, the focal point of Central Park South. The building was converted to a cooperative in 1937 and has 175 units. 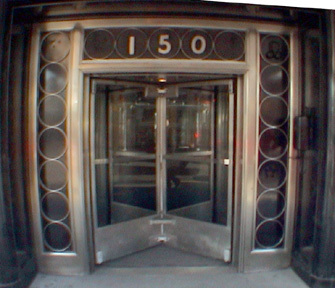 It has some terraces, a doorman and a canopied entrance with a revolving door but no health club. It is convenient to public transportation, shopping and restaurants and is, of course, across from Central Park and has spectacular views.